To properly understand the foundation and beginnings of the Bitchu Aoe School (備中青江) we must first study geography and history. The old Kibi (吉備国) region of Japan covered an area of Western Honshu that is mostly included in today’s Okayama Prefecture. From ancient times until the Muromachi Era this area was comparable in cultural and political importance to that of the Kinai (畿内) and Kita-Kyushu (北九州) regions. This was largely due to the abundance of fine sand iron that was used not only for swords, but also to produce all kinds of iron tools for woodworking and farming since ancient times. The Kibi (吉備国) region was divided into three almost equally sized areas by the presence of three major rivers that, starting from the Chugoku Highland, flowed southwards into the Seto Inland Sea. These rivers were the Yoshii, the Asahi, and the Takahashi. These rivers carried rich sand iron from the highlands down to the lower areas giving rise to the groups of sword smiths that eventually formed the major Bizen and Bitchu schools. These groups were the Fukuoka Ichimonji (福岡一文字) on the Asahi River, the Osafune (長船) on the Yoshii River and the Aoe (青江) on the Takahashi River. 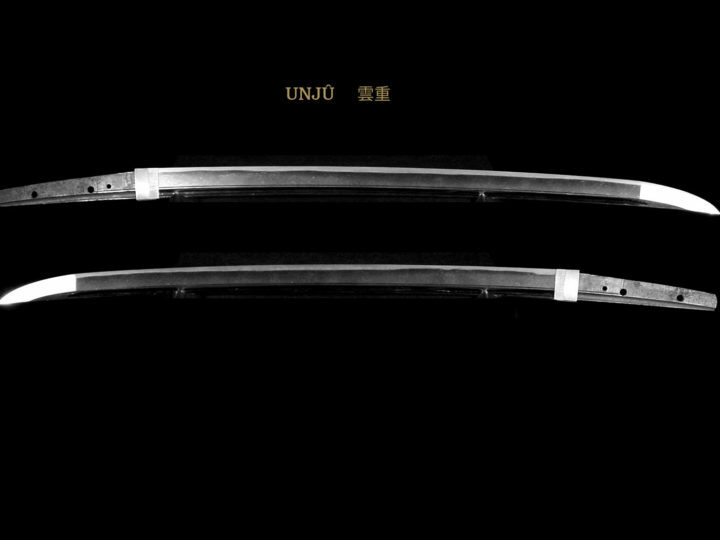 The excellent workmanship of the Bitchu (備中) sword smiths was comparable to that of the smiths of the Bizen (備前), Yamashiro (山城), and Yamato (大和) traditions. Sword smiths mostly gathered around Aoe (青江), present day Kurashiki-shi in Okayama Prefecture, brought the prosperity of the Bitchu (備中) tradition forth. There were also known to have been some smiths scattered in adjacent areas of Masu and Seno. The first artists of the Bitchu Aoe School (備中青江) came forth toward the end of the Heian period. The smith credited with starting this tradition is Yasutsugu (安次). Unlike the Bizen (備前) tradition that was prosperous until the end of the Muromachi era, the Bitchu (備中) School died out earlier. Some scholars say it ended with the end of the Nanbokucho era while others say it lingered on into the beginning of the Muromachi era. All agree, however, that no matter when in ended, the quality of the swords produced declined severely after the end of the Nanbokucho era. The Bitchu Aoe (備中青江) tradition is divided into three major classifications, Ko-Aoe (古青江), Chu-Aoe (中青江), and Sue-Aoe (末青江). That is, old Aoe, middle Aoe, and late Aoe. One other important difference between the Aoe tradition and the Bizen tradition is that unlike the Bizen tradition it did not form into cliques or sub-schools. Rather, the names of individual smiths were handed down for several generations with each characteristic workmanship style continued by successive smiths of the same name. This phenomenon makes it most difficult pin down production dates for the works of artists whose name was used for too many generations to make definitive distinctions. 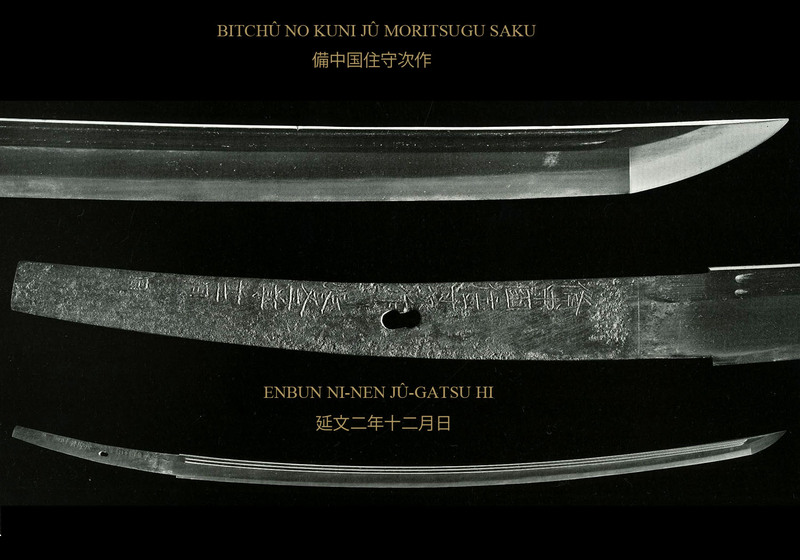 The quality of the Bitchu Aoe (備中青江) smiths of the Kamakura era was highly recognized and this is evidenced by the fact that three of the twelve kaji (smiths) invited by the Emperor Gotoba to come to Kyoto to forge swords were smiths from Bitchu (備中). They were Sadatsugu (貞次), Tsunetsugu (恒次), and Tsuguiye (次家). Getting back to the divisions of the Bitchu Aoe (備中青江) tradition into beginning, middle, and late, it should be noted that these divisions of workmanship are not as clear-cut as one might think. While Ko-Aoe (古青江) and Sue-Aoe (末青江) are relatively distinct in their characteristics as manifested by their respective artists, Chu-Aoe (中青江) which is supposed to stand for certain characteristics born during the period between the beginning and end of the Aoe (青江) age, contains a considerably wide variety in its workmanship, making it difficult to give concise definitions as to the beginning and end of this period. Ko-Aoe (古青江) is the term that refers to production from the late Heian to the middle of the Kamakura eras. The Sue-Aoe (末青江) (late Aoe) is the comprehensive name given to all Aoe (青江) smiths who worked around the Enbun (延文) days. This would include the Bunna (文和) (1352-1355), Enbun (延文) (1356-1360), and Joji (貞治) (1362-1367) eras. As for the Chu-Aoe (中青江), it is considerably more difficult to draw clear-cut lines at both the beginning and end of its time period because the artists and their workmanship did not reflect individual characteristics as much as the Ko-Aoe (古青江) and Sue-Aoe (末青江) artists did. However there are many dated blades from the end of the Kamakura around Showa (正和) (1312-1316) to beginning of the Nanbokucho era around Kenmu (健武) (1334-1335). (守遠), and others followed Noritaka (則高). There are no particular differences in the workmanship between the two families. SUGATA: Extant works are limited to tachi only. Tanto must have also been produced, but none have been found to date the sugata is typical of the period being slender with a ko-kissaki and marked funbari. The koshi-zori is very deep and is distinguished from that of Bizen by the fact that the deepest part of the sori is at the habaki-moto. That is slightly farther down the blade than that of the Bizen and Yamashiro schools of that time. The sori in the upper part of the blade, however, is very shallow. 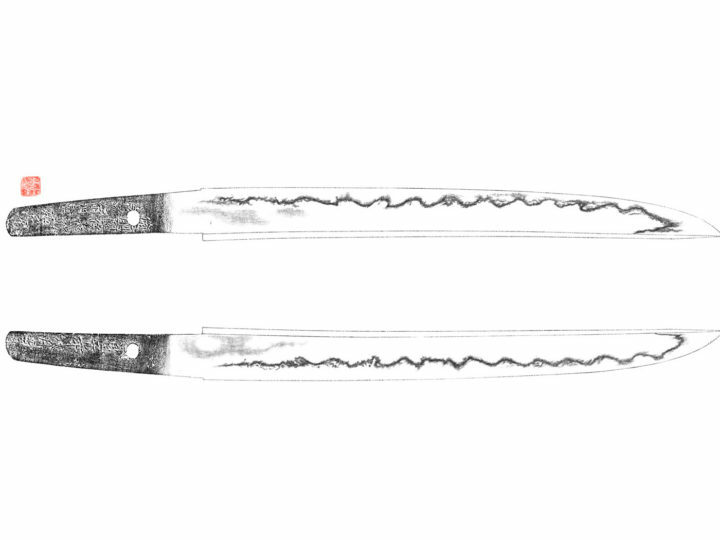 JIHADA: Ko–Aoe blades have a distinctive feature called chirimen-hada. The closest translation into English would be crepe-silk hada. Also, sumigane or dark spots are also frequently seen in the steel. Mokume hada will also be present either in the form of o-mokume or ko-mokume depending on whether the blade is nie based or nioi based. Often utsuri and chikei will appear showing the close ties with Bizen production. HAMON: Ko-Aoe’s major patterns are based on suguha with ashi and yo. The suguha will be mixed with ko-choji or ko-midare containing ko-choji. In either instance the hamon will be lined with a great many nie. Kinsuji, ashi, and inazuma will be found and the ha-hada is visible. 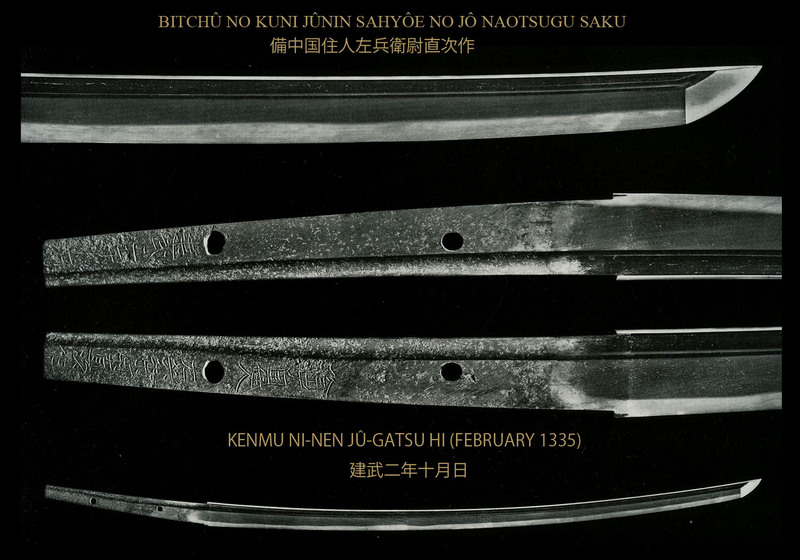 In late Ko-Aoe, nie becomes less apparent and the hamon is inclined to have more nioi, showing considerable influence of Bizen tradition workmanship. HORIMONO: Occasionally bo-hi is found. Other types of horimono are almost never seen. BÔSHI: The bôshi is in proportion to the hamon becoming midare komi or suguha. The kaeri will be short and occasionally an Ichimonji kaeri will be found. NAKAGO: The shape of the nakago is generally long with sori. Those with niku on the ha side are most common. Occasionally there are some that are kijimono. As for the saki, a slender shallow kurijiri or a kirijiri is most common. The yasurimei becomes o-sujikai, and rarely there is one with sensuki (straight lines from the drawing tool used to shape the nakago). MEI: Ko-Aoe artist’s mei in most cases consists of two characters incised with a thick chisel. Tachi-mei in general on works produced by other schools in the Heian and Kamakura periods were chiseled principally on the haki-omote, while the works of the Bitchu-Aoe artists are often found on the haki-ura of the tachi. Nagamei and nenki (dates) are almost never seen. As previously mentioned, what is called the Chu-Aoe period extends roughly from the middle to late Kamakura era to the beginning of the Nanbokucho era. It should be emphasized again that these lines of distinction are by no means clear and finite. SUGATA: Tachi are most common but tanto are seen as well. The mihaba becomes wider than in the previous period and while chu-kissaki are most common; there are some with an extended kissaki. Nagamaki are found and tanto are divided into two basic shapes. The first is of a standard length of approximately 26 cm. and has uchi-zori, thick kasane, and a narrow mihaba. 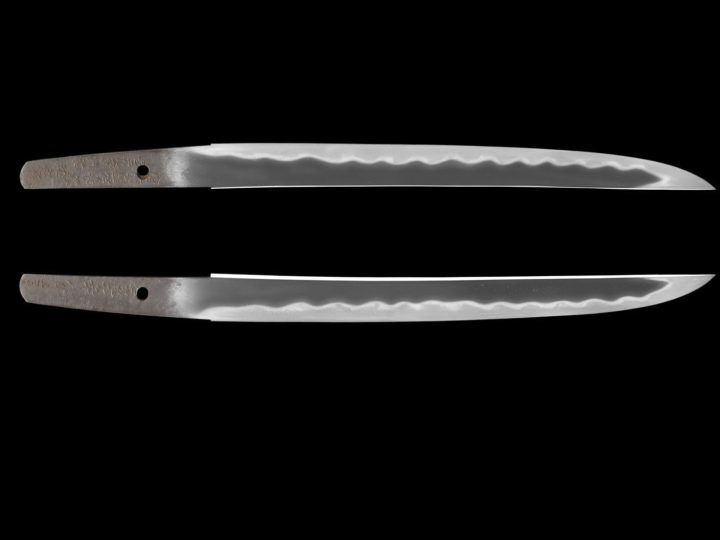 The other is a ko-wakizashi with saki-zori, a wide mihaba, and a thin kasane, which is hira-zukuri in construction. JITETSU: Most common are those with a fine itame hada as opposed to the large hada of the Ko-Aoe period. A fine mokume-hada with some o-hada will also be seen. Occasionally pieces with a hint of utsuri will be found. As with the Ko-Aoe, sumigane will be found and is an important kantei point. HAMON: There are two general types of hamon in this period. The traditional suguha based hamon of the Ko-Aoe period continues and we also find a robust midareba hamon containing both Bizen and Yamashiro characteristics. The hamon becomes more nioi based with nezumi ashi, saka choji, and saka ashi. 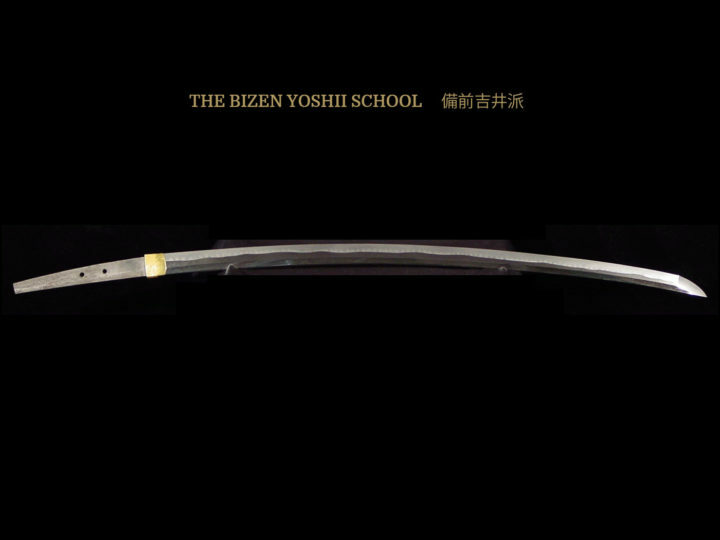 The distinctive feature of the Aoe school blades is that the hamon is inclined to a slanting pattern but it never reaches the width of the saka-choji midare hamon of the Katayama Ichimonji School. HORIMONO: There are a lot of bo-hi and futatsu-hi. In tanto there are suken, bonji, and such. BÔSHI: The most common are those that are suguha or notare. The top tends to be pointed with a longish kaeri. The nioi-guchi is tight with an abundance of ko-nie. NAKAGO: In tachi, there are some with shallow sori, and in tanto, those with mu-sori and a long nakago are the most common. Kurijiri is the most common. The yasurimei is the usual o-sujikai and rarely sujikai and kiri will be found. Around the beginning of the Nanbokucho era we find the start of what is known as the Sue-Aoe period. Scholars disagree on exactly when this period of sword manufacture ended. Most feel it ended with the end of the Nanbokucho era, but others feel it extended into the Muromachi era. Both agree, however, that the end of the Nanbokucho era marked the end of the production of outstanding swords by this school. 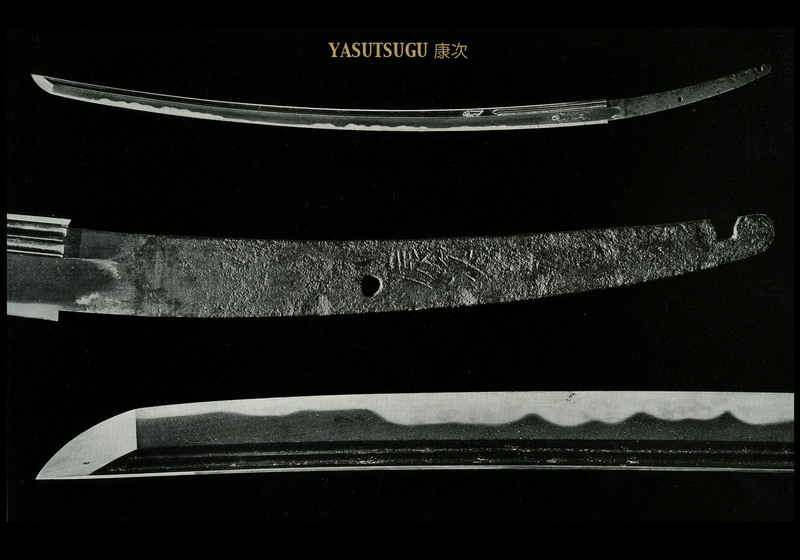 SUGATA: The tachi produced during this period were what we call o-dachi with a length measuring over 90 cm. The wide mihaba and modest sori together with the o-kissaki form a majestic shape. Tanto also began to have marked sori and extended dimensions since about the end of the Chu-Aoe period. Iori mune is most common, but mitsu mune and maru mune are also found. JITETSU: The ji-hada is a tight and clear ko-itame with some mokume mixed in. There are some with a hint of shirake. The presence of sumihada is scarce. HAMON: The crisp nature of the nioiguchi became tight enough to form a threadlike suguha pattern. Also, the saka-choji–midare which had come into being at the end of the Chu-Aoe period, advanced not only in its exuberance but also in its diversity of structure. The nioiguchi became wide and the midare became busy. The most important feature is that the hamon became of pure nioi structure. HORIMONO: Bohi and futatsuhi are the most common. Ken, suken, gomabashi, bonji, and such are also seen. BÔSHI: In works that are suguha, a maru turn back with an ordinary kaeri is most common. In the midare works, those that are midarekomi thrust upward and have a strong kaeri are the most common. NAKAGO: Tachi with an ubu nakago are few. Tanto nakago tend to be stubby with kurijiri or ha-agari kurijiri are the usual shape. O-sujikai is the most common type of yasurimei. MEI: Nagamei are found on tanto and on unshortened tachi. Almost no katana mei are seen on tachi.